I had an enjoyable time at recent Blake’s 7 convention in Oxford. I attended as a guest with my B7 audio colleagues David Richardson and Simon Guerrier. So my thanks go to Clare and Diane for the invitation and their hospitality. It was fun to see Gareth Thomas again, and meet Michael Keating properly for the first time. Stephen Greif even turned up at one point. During the event, Gareth and Michael did a live audio commentary on the final episode, Blake, as part of the convention’s theme: “Return to Gauda Prime”. And it reminded me of my first visit to Gauda Prime 30 years ago, with my two friends Peter Lovelady and Tony Murray. The three of us attended the studio recordings of that final episode. It’s hard to imagine that happening these days. In recent years, I’ve had the good fortune to get into the Doctor Who and Torchwood studios in Cardiff as part of my work writing novels and audios. But that sort of thing is still rare, and visitors have to sign confidentiality agreements. The most significant scenes are recorded on closed sets, with access restricted only to those with a need to know. 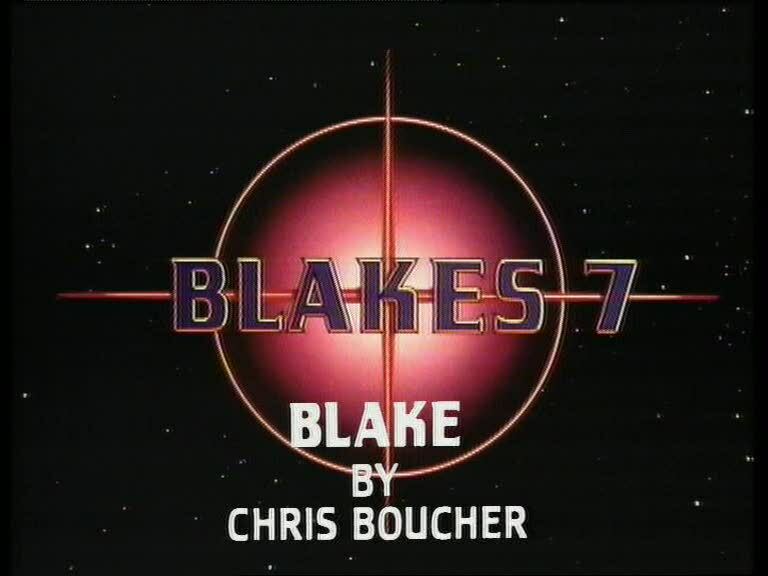 The Blake’s 7 episode we went to see recorded in 1981 included the destruction of Xenon base, the final crash of Scorpio into a forest, the return of Blake, his death at the hands of Avon, and the killing of all the main cast. So you can imagine the confidentiality agreement we had to sign before they would let us into the studio. None at all. We just turned up. With the benefit of hindsight, it’s all the more surprising we were invited. 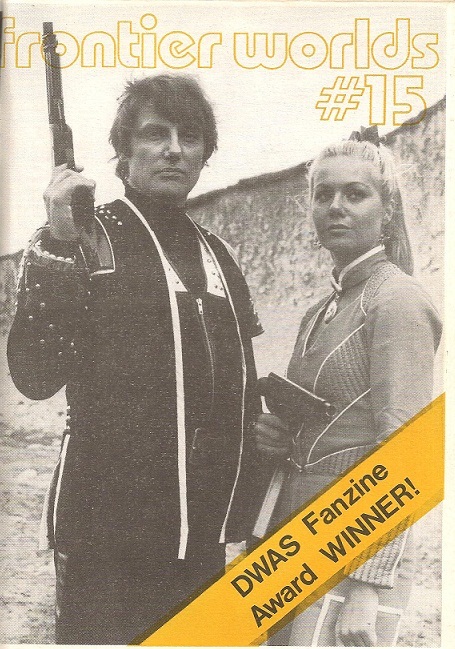 It came about because the three of us ran a modestly successful fanzine called “Frontier Worlds”. 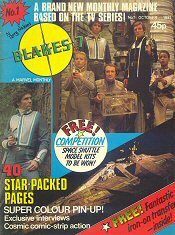 Our friend Jeremy Bentham had worked on the original Doctor Who Weekly, and he’d suggested that we send a portfolio of our work to Stewart Wales, the editor of Marvel’s new tie-in magazine Blake’s 7 Monthly. Stewart saw enough potential to invite us to a meeting in London, and while we were there we could also visit the set of the TV series. Stewart also put us in touch with producer Vere Lorrimer, who invited us to visit a TV recording. The next opportunity turned out to be the penultimate recording day for the final episode of Series D. And at the time, that’s all we knew. Our first priority on the day was to visit the offices of Blake’s 7 Monthly. We’d anticipated Fleet Street, but it turned out to be a set of rooms up several flights of stairs above a barber’s shop. And by the time we were there, Stewart wasn’t – he’d been called away to a Marvel meeting. We had some lunch and came back, but still no Stewart. Instead we had a chat the former editor of AD: 2000 before scurrying off across town by tube to BBC Television Centre in Wood Lane. 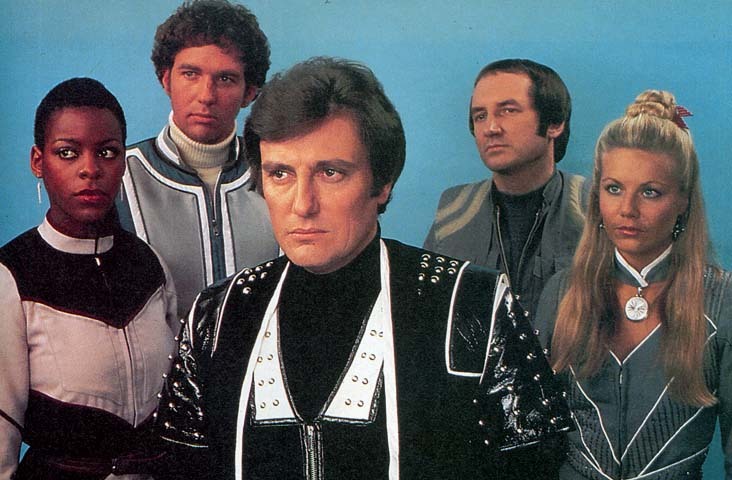 Blake’s 7 was the drama series with which the BBC replaced a police series called Softly, Softly: Task Force. Like most BBC drama serials, it was recorded on video using a multi-camera set-up in the TV studios within the Corporation’s main production centre in Shepherd’s Bush. Some external scenes were filmed on location in advance of the studio work. Ahead of the studio days, the cast would rehearse in a large multi-storey building down the road in Acton (and thus nicknamed the “Acton Hilton”). Rooms the size of a dance floor were arranged so that the outlines of studio sets were marked out with simple poles and tape lines, with perhaps a cardboard miniature of the set design to look at to help visualise everything. The cast would learn their lines and movements (or “blocking”) for the studio days. And the director would plan her camera positions, with the production manager marking up a script with camera moves and edits so that everything was ready for the intensive rehearse-record days to follow in TV studio sessions. Towards the end of the rehearsal period, a “producer’s run” took place for the producer to see the proposed performances and provide any notes he may have. Typically, technical preparation happened in the morning of a studio day, with the cast prepared in costume and make-up ready for recording sessions in the afternoon and evening – usually completing at or before 10 pm. For us three visitors, therefore, arriving after lunch on the penultimate studio day meant that we’d get a tour of the sets and a chance to see rehearse-record later in the day. Vere Lorrimer met us at TV Centre reception – a charming bespectacled man wearing a leather jacket. He shook our hands and invited us to follow him to the studio. He led us through some doors and past the heavy black curtain that encircled the studio. We saw some greenery, and then were brought into the centre of the huge, cold room. The hundreds of ceiling-mounted studio lights were off, and would be switched on later only for the recording, when the room would become a lot warmer as a result. Between the sets was the paraphernalia of recording – cameras, sound booms, and monitors in colour and black and white because, as the producer explained to us, “some people will be seeing the programme that way at home.” Yes, it really was that long ago. At the time, there were only three TV channels in the UK — BBC1, BBC2, and ITV in its various franchises around the country. Channel 4 was not due to start until the following year, and cable or satellite channels were a distant thought. We saw various sets from Gauda Prime, including the tracking gallery and the hut in the forest, before we were led past the Scorpio set. That should have been an early clue for us – wires and boxes led from the set all over the place, with a beam hanging ominously from the roof. Vere Lorrimer explained that this was a fixed set, and Scorpio was wired for explosions later, when pine trees would be placed into the set to make it look as though the ship had smashed into a forest. As we were about to move on, Vere Lorrimer introduced us briefly to effects man Jim Francis, with whom he had a brief discussion about saving Orac and Slave from the wreckage for some sort of display later on. Peter Tuddenham was going to make a tape for this. I’m not sure if anything ever came of that. The final set was the flyer, with a huge blue screen behind it to facilitate the Colour Separation Overlay (CSO) that would make it “fly”. Blue was the more usual keying colour for this video effect, whereas these days “green screen” is more familiar than “blue screen” work. Treading cautiously to avoid setting off any Scorpio explosions, we passed “Orac’s World”, a small enclosed space behind the Scorpio set where Peter Tuddenham provided the voices for the Slave and Orac computers live during the recording. There was a large microphone for Slave, and a close-contact “racing commentator’s” mike for Orac. The familiar Orac whining and squeaking was put on in post-production. Vere Lorrimer explained all this in an enthusiastic running commentary of his own, doing a little impression of each computer in the process. Peter Tuddenham had told us during a “Frontier Worlds interview” that during Terminal, the concluding episode of the previous season, he discovered that someone had put a bowl of flowers in his little performance space, which was then known as “Zen’s Den”. If only we’d known what was to happen during our studio visit, perhaps this time we could have left a wreath. We traversed the metal stairs which led up the side of the studio wall to the gallery, where the crew’s most senior staff were at work. In my next post, I’ll explain more about what we saw during the recording, and what success we had with Blake 7 Monthly.